The main desk at the front is two metres wide and has two levels; plenty of space to store things I need to have close at hand. On the left of the room are a bunch of fishing tackle boxes, drawers, trays and little boxes which I lift out and place on or under the desk as needed. On the right of the main desk is an IKEA Vika Veine hinge desk, which allows me to store projects in progress and keep things tidy. Inside the desk you can see a couple of cutlery trays (which I also picked up at IKEA; Rationell Variera are nice and cheap). 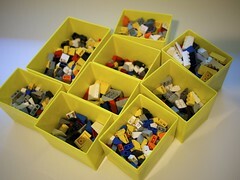 I’ve found it’s handy to have at least two of these; one for temporarily storing handfuls of parts ready to build and another to sort dismantled parts ready to put back into their respective drawers. 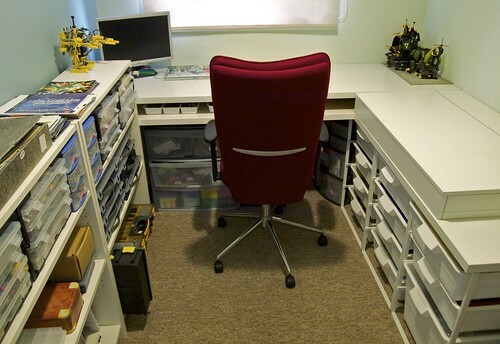 This right hand desk sits on top of a three IKEA Antonius drawer frames, each of which is filled with large plastic drawers. 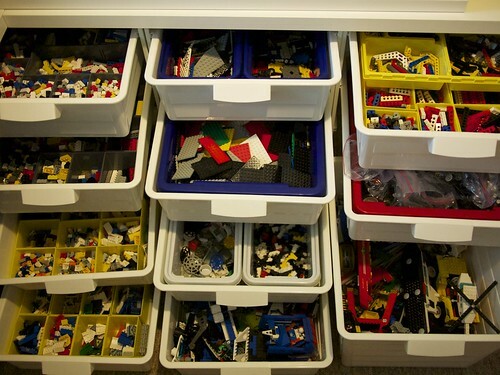 Each drawer is quite big, so in order to store lots of different types of LEGO part, I have filled some of the drawers with small removable storage boxes. 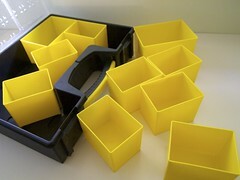 I had some Stanley organisers, which each have 10 removable compartments. Plus, if you ever need to travel with a selection of parts they can pop back into their carry cases for easy transportation. 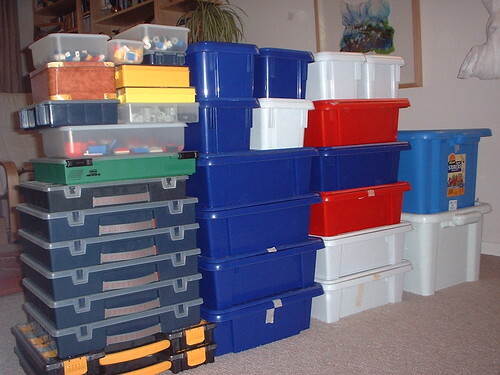 Different people have different techniques for storing large collections. Some even stack their bricks and plates for efficient storage, which I’m fascinated by but have never really got on with. 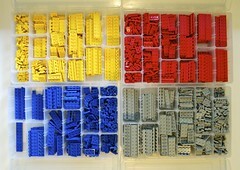 Personally, I’m a massive fan of the lots-of-little-drawers-and-trays approach. 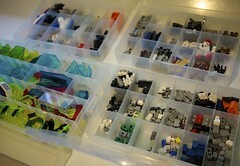 There’s still a bit more sorting to do and (believe it or not) still a bit of room for more storage. 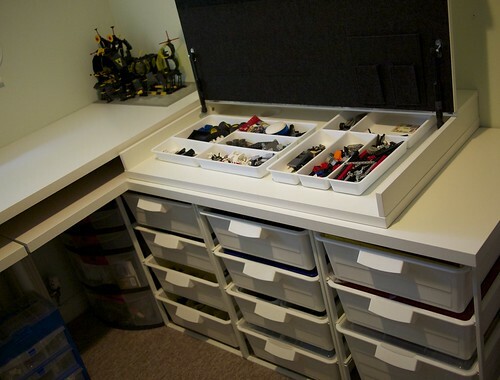 I’m really tempted to add some by some Draper 12015 30 drawer organiser cabinets or even LEGO’s own cabinet. Today is my last day at IBM Hursley. I’m saying goodbye to some lovely people (not all of whom are pictured here) so I made Lego versions of some of them as a going-away present. I’ll be in the traditional Hursley drinking spot, the Dolphin, all afternoon today. If you’re around, come and say hi. Here are the slides and audio for the talk I gave at Interesting 2008 yesterday. 30 slides in 3 minutes. I’ll post my notes on the day later when my brain recovers a bit more. Rest assured it every bit as interesting as last year. Update: my notes are here. Update: the Guardian are hosting a series of videos of the Interesting 2008 talks. Here’s my talk. 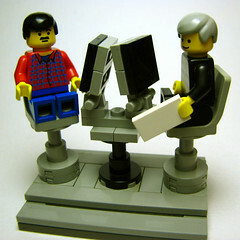 The custom Google header image tells me that LEGO turns 50 today. 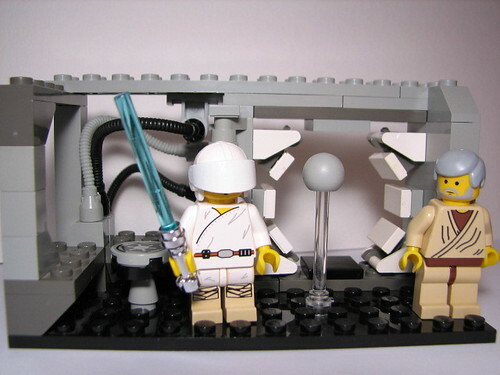 I’m a huge LEGO geek (that’s my collection on the left), and to celebrate the milestone I thought I’d share a custom LEGO creation of mine from 2005, ‘Luke Learning the Force’. Chris taunts another contestant with a cheque…. but we don’t want to give you that. February 4, 2006 | art, geek, lego, toys | Comments Off on Who wants to be a millionaire? 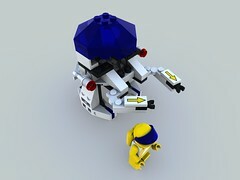 Made the model in MLCad. 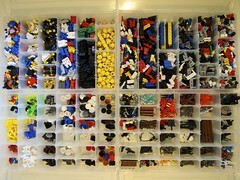 (Find instructions for the set at peeron). Converted to POV-Ray using Lars C. Hassing’s L3P.